Barry, Vale of Glamorgan, CF63 2AW. Operating up to 2.0 metres per second as standard, our internal high speed doors provide a fast and efficient access solution with the added advantage of being re-set after impact. Our self repairing speed doors provide a fast and efficient way to provide rapid access while reducing drafts and saving energy. Unlike conventional speed doors, in the event of impact these doors can be re-seated and put back into commission with the push of a button. Anodised aluminium guides are standard with all our internal high speed doors models. As standard each speed doors curtain is manufactured from 1000 D-Tex Polyester Reinforced PVC with other options also available. Infrared light curtain, bottom safety edge, electric motor brake and EN Wind Class II 115 km/h as standard. 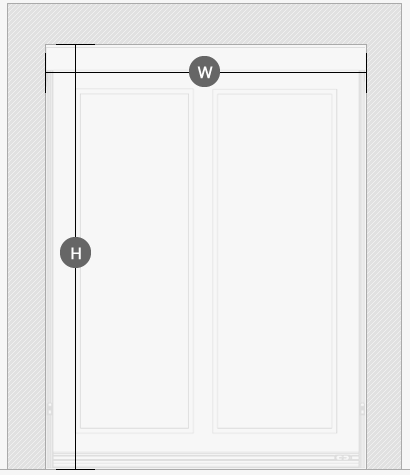 Each speed door is manufactured with full width vision panels as standard with other options also available. Accidents happen. Using our HMWPE zip system, our self-repairing system allows the curtain to be re-seated into the guide at the push of a button. Operating up to 2.0 metres per second as standard, our internal high speed doors provide a fast and efficient access solution. Operating up to 2.0 metres per second as standard, our self-repairing high speed doors provide a fast and efficient access solution with the added advantage of being re-set after impact. Available with forklift pull cords, traffic lights, remote control, passive radar sensors and magnetic loops to make vehicle entry fast and simple in either direction. Suitable for pedestrian traffic and automated entry systems using electronic swipe cards, remote control, pull cords, push buttons and digital keypads. High quality D-Tex curtains, extruded aluminium guides and duty rated motors, our doors are designed to cope with the most demanding applications. At the heart of doors are powerful and intelligent frequency inverter drives. This provides all doors with variable speed and a ramp start/stop feature. Our range of vision window options allow you to specify the correct amount of vision for your individual application. 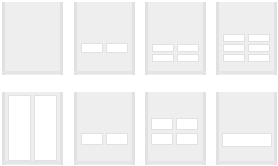 We have a solution to suit every requirement from security and minimalistic to full width any multiple rows, whatever the requirement there’s a solution available. Quality. Reliability. Performance. Every Time. Using the highest quality components, all of our speed door products are designed to provide the very best performance and reliability. 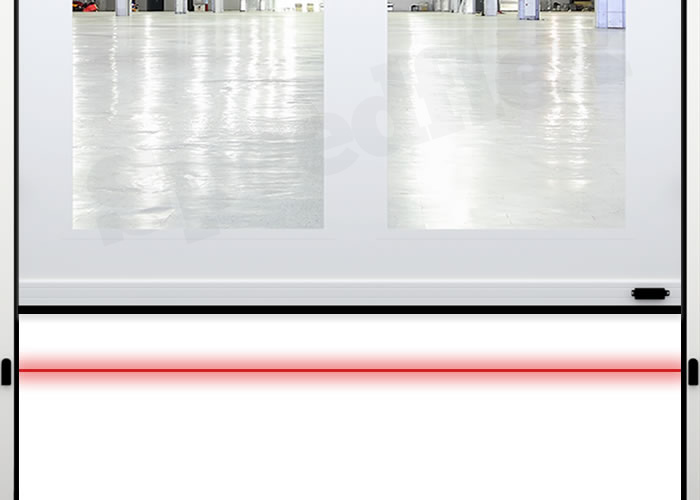 Emitting a beam of light the full width of the door, our infra-red sensors provide an added layer of safety to each door. 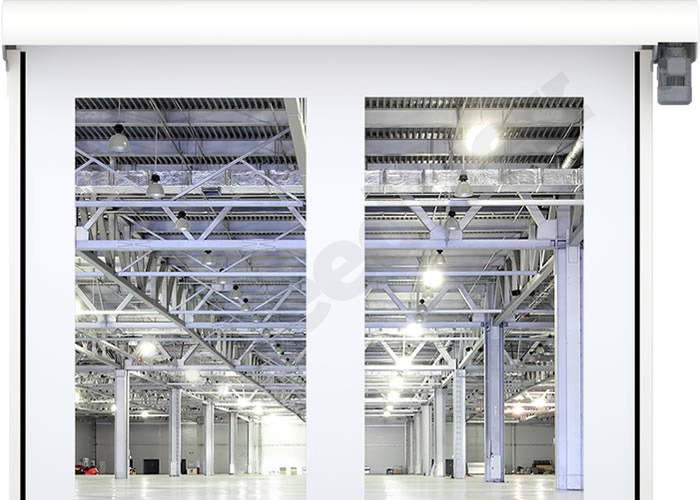 Infra-red light beams operate by sensing movement and objects the entire width of the door. If the IR beam is obstructed the door will return to the open position until such time as the obstruction is removed. 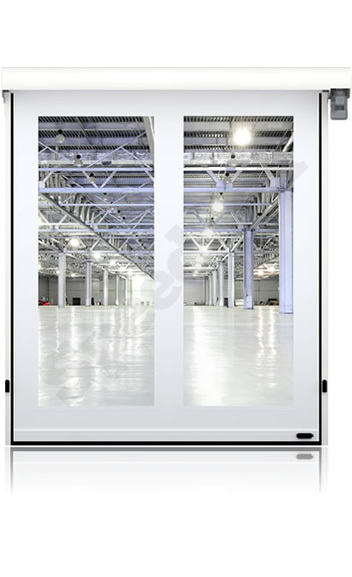 All doors are provided as standard with inverter control panels and operators. 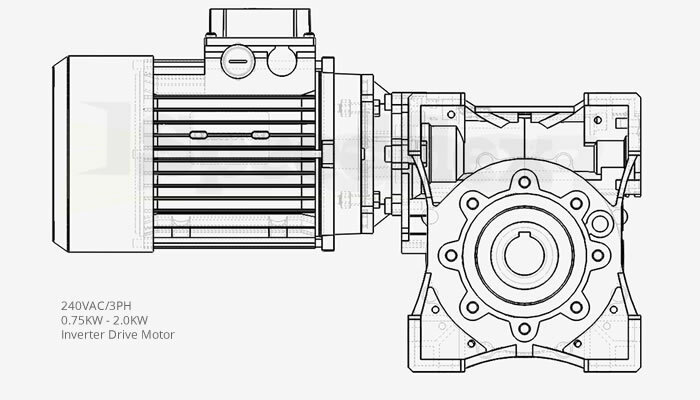 Inverter technology extends the life of the motor by providing a soft start and stop operation. Inverter operation also provides the ability to control the opening and closing speeds via parameters set in the control panel. Using quality engineered motors and operators, each door is designed to perform in excess of the demands of your application. All our doors are supplied with duty rated motors to ensure the very best in performance and reliability. In the event that future service is required, we also keep stocks of all motors and spare parts to ensure the very best after-sales support experience. We appreciate the investment our customers make when purchasing any of our products. That’s why we pride ourselves on providing a commitment to ensuring the very best after sales support for the life of our products. From spare parts to help and advice, we got it covered. Comprehensive technical information is available for all Speedflex products. Using the latest industry standard software, we provide a wide range of technical information including Architectural Drawings, CAD Blocks, Engineering Drawings, Specification Sheets, O&M Manuals and more. We also provide a 3D product visualisation service for all products. Speedflex are accredited with 5 separate SSIP safety schemes and CDM approved contractors for larger projects. Our qualified door engineers have many years of experience working in some of the busiest, and largest facilities in the UK with a faultless record for safety. Talk to us to see how we can help you today. Our highly skilled team is always happy to share its technical expertise and answer any questions. Speedflex® is a Registered Trademark.